The rest and service area company is a leading provider of catering services, retail businesses, hotels and fuel on motorways in Germany. Together with its leaseholders, the company offers a comprehensive service around the clock for people travelling on the motorways, allowing them to relax and recuperate. In addition to a filling station with a restaurant and shop, the rest and service area between Hamburg and Berlin also offers overnight accommodation in a hotel. The waterworks in the rest and service area was destroyed in a fire in May 2012. 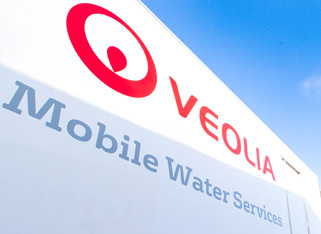 Following initial emergency bypassing of the water supply, the engineering company which, among other things, was involved in the well construction, commissioned Veolia Mobile Water Services with the installation of a mobile temporary well water treatment system and plant technology for the new waterworks. This solution needed to meet the constraints of the health authorities to ensure that the filling station and rest area remained open during construction of the new well water plant. Only two days after receiving the order, Veolia delivered a type MOFI 4x10C mobile gravel filter plant to the rest and service area. The system contains four filter modules installed in a container for the removal of iron and manganese from the well water through a flexible throughput of 5 to 40 m3 of well water per hour. The mobile plant ensured a water supply to the filling station and rest area for eight weeks until the new waterworks was commissioned. Temporary bypassing of the well water treatment plant with the aid of the mobile filter system enabled the rest and service area to continue operations until the new waterworks was commissioned. The system ran fully automatically for the rest and service area operator without the need for any additional work.